In this example, the security check is PinCodeAttempts which was defined in Implementing the CredentialsValidationSecurityCheck. The challenge sent by this security check contains the number of remaining attempts to login (remainingAttempts) and an optional errorMsg. The minimum requirement from the SecurityCheckChallengeHandler protocol is to implement a constructor and a handleChallenge method, which prompts the user to provide the credentials. The handleChallenge method receives the challenge as a JSONObject. The implementation of alertMsg is included in the sample application. To achieve this, use the SecurityCheckChallengeHandler’s cancel() method. Some scenarios may trigger a failure (such as maximum attempts reached). To handle these, implement the SecurityCheckChallengeHandler’s handleFailure method. The structure of the JSONObject passed as a parameter greatly depends on the nature of the failure. The implementation of alertError is included in the sample application. Optionally, you can also choose to do something before the framework closes the challenge handler flow, by implementing the SecurityCheckChallengeHandler’s handleSuccess method. Here again, the content and structure of the JSONObject passed as a parameter depends on what the security check sends. In the PinCodeAttempts sample application, the JSONObject does not contain any additional data and so handleSuccess is not implemented. Note: Creating a WLClient instance and registering the challenge handler should happen only once in the entire application lifecycle. It is recommended to use the Android Application class to do it. 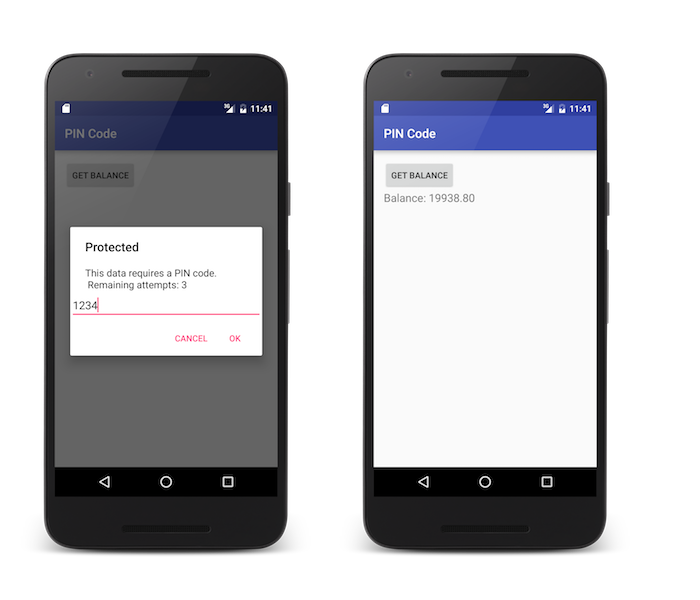 The sample PinCodeAndroid is an Android application that uses WLResourceRequest to get a bank balance.